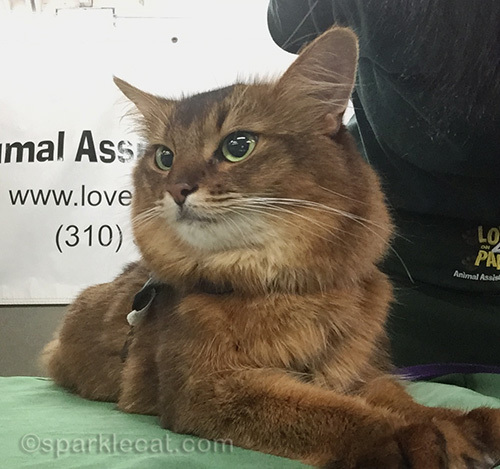 Being a therapy cat is not all about visiting patients and giving out doses of purr therapy. Sometimes I also have to be a spokescat for the organization. That’s what I did this weekend. 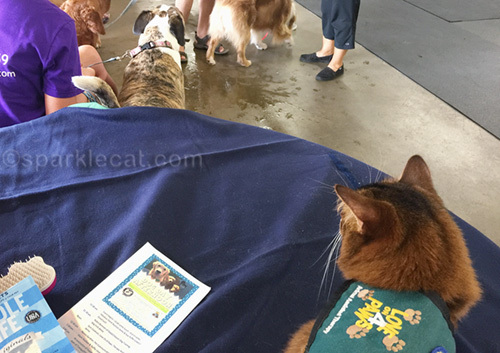 A doggy day care and boarding place called Camp Run-A-Mutt had an eventÂ â€” the Dog Day Afternoon Fundraiser for The Dexter Foundation Dog Rescue. 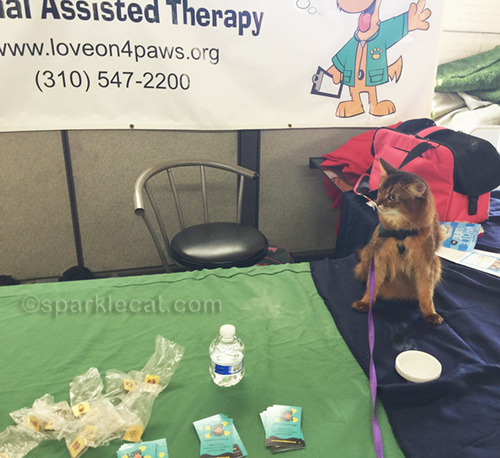 My organization had a table to spread the word about therapy pets and to hand out literature. 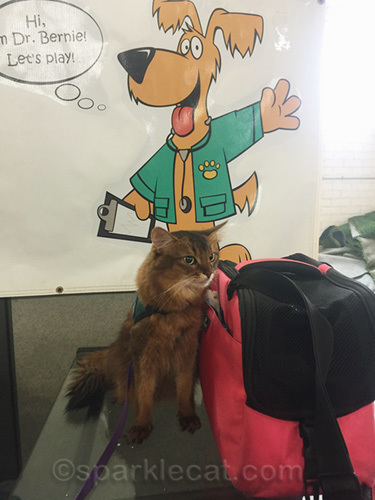 Camp Run-A-Mutt said it was okay if one of the therapy cats came, so I got a special request. My human was reluctant at first. It didn’t have anything to do with the dogsÂ â€” she knew I would be okay with them. It was the drive! She tries to keep them under half an hour each way, to make sure my total travel time is shorter than my visit time. So she pulled out her GPS and figured it out and it was just about our maximum time, so she accepted for us. She knew I would enjoy doing this. We were the first team there, so we set up. I had to sit in the carrier while my human did that because she is overprotective. She wanted to be able to keep an eye on me the whole time I was out. She was worried there would be too many barking dogs, or that they’d come right up to the table and be aggressive with me. Of course, nothing could have been farther from the truth. All the dogs there were very well behaved, and so were their humans. I got a lot of attention and got lots of pets… and treats too! I even High Fived a few people. A lot of people remarked about how “chill” I was. 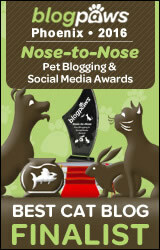 Not sure why that was such a big deal… I’ve been to two BlogPaws conferences, and they were bigger and had more dogs. There were a couple of dogs at the table next to ours and at one point, one of them was wagging his tail like a cat toy! I really wanted to go check it out, but my human said no. My human also brought a little cat brush along to give her something to do when she wasn’t talking about our therapy organization, and also to keep me looking nice. 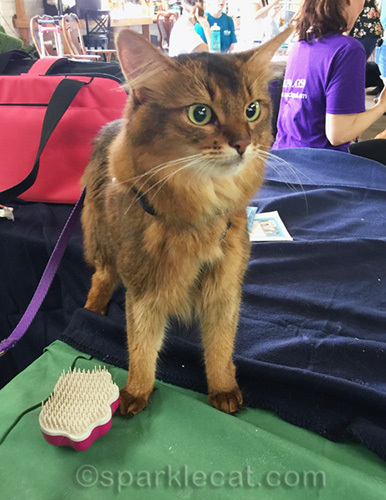 It was really hot and humid where the event was, though, and while I wasn’t shedding much, every strand of fur stuck to her! She even got some in her mouth! Now she knows how kitties feel. The two of us had to get up and do a short talk about the organization we belong to, what we do, and why it’s so gratifying. My human told the MC to poke her if she saw her trying to rub fur off her face. Have I mentioned before how clumsy my human is? 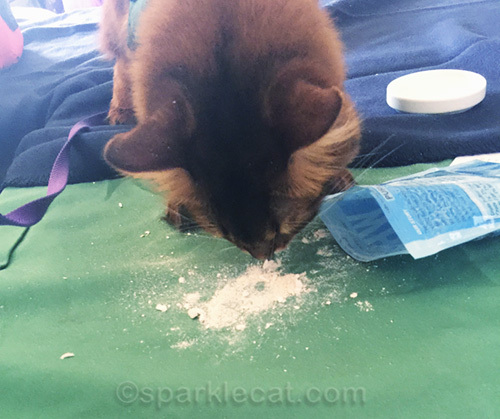 She brought a bag of some of my favorite treatsÂ â€” and spilled them on the table! 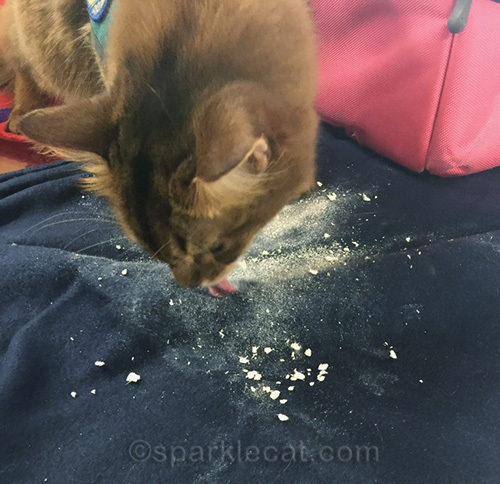 She cleaned it up as much as she could, but I still got to lick up some of the treat dust. Oh, and she did it a second time! This time she spilled the treats on the fleece blanket she brought for me. That had to go in the laundry when we got home. The other team showed up for the second shift (it was Mr. Scruffles and his humans), and my human packed me up to go home. They said we could stay, since I was doing so well there, but my human was dying from the stuffiness of the hall, and she had already made plans. I totally would have liked to stay, though! I can’t believe your human would not let you check out the dog-tail cat toy! Dog tails make the perfect toys. Crazy Django likes the dog better than anyone who lives here and will only purr for the dog. Glad you had a good visit and extra treats. Wow your grace under fire is a real gift Summer. Glad to see a kit smashing the pet-riarchy at a dogs event. Wow, you sure get around in your area! Some doggy;s have ‘feathers’ on their tails, that *would* be tempting when they twitch and wiggle as they wag! You do what we cant and we love you for it! We think you’re very brave, Summer. We see the dogs of our neighbors through our windows and we don’t even like that! What a fun event! I love how you enjoy every new thing you get to do so much. You never stop doing good things for everyone. Summer, it’s obvious that your human hasn’t learned a thing about being chill from you yet! What fun! We especially liked you saying the dogs were very well behaved and so were their humans. That last part, we would think, is very, very important! Ooo, that dog tail would’ve been so tempting! We’re glad you and your human had a good time with all those dogs. 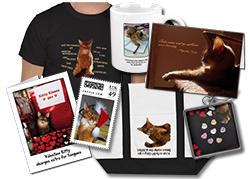 You’re a great representation for therapy pets! You are doing good, Summer! It’s hot here too and when my mum kisses me she gets fur stuck to her lips. She says she doesn’t care. She quite likes it! This sounds like a great organization! I’m not surprised that you impressed everyone pretty Summer, you are pretty amazing! Sure am glad you didn’t play with that dog’s tail, Summer. That could have been a disaster. Good girl for greeting everyone. Oh dear me Summer I can only imagine how intriguing a waggy dog tail was to you. Looks like you had a fun time. I’m glad the dogs behaved well too. Some dogs can get kind of rowdy sometimes. No, no, no – wagging dog tails are NOT cat toys! And there you were being your amazing self! Sounds like a grand adventure… Theo’s favorite toy is Diego-san’s swishing tail. Is there anything you are not cool about ? Taking all that in your stride – it’s incredible. The burmese here are pretty chilled but you are so cool you indeed are Arctic! Paws up to you. This sounds like a wonderful experience to expand into the dog world. What treat comes in powdered form? Btw, you left comment before I revised and missed half including David Michie’s new book! My mom feels for your human! Remember ? When I went to animal hospital I was among all the doggies because it was Canine section! Mom was worried about me too, lucky, I didn’t want to get out of my carrier anyway. Yeah it was a panic time. Me & mom kudos to what you have done for this project. We proud of both of you. You are a big time shmoozer, Summer! Da Beebs wants you to know that when he was a tiny kitten Tommy’s wagging tail was his favourite toy! Aren’t hairs protein? Good that you human got to eat some! Looks like a fun event. You’re a very good spokesperson!